Julia Morgan Ballroom at the Merchants Exchange is an architectural masterpiece in the heart of San Francisco’s bustling Financial District. For more than 110 years, this legendary space has hosted the city’s most important events, including visits from U.S. Presidents, Nobel laureates, business icons and the brightest stars of film, music and sports. Weddings at the Julia Morgan Ballroom are elevated affairs, new chapters in our unparalleled San Francisco history. Weddings and celebrations at the Julia Morgan Ballroom are designed to be exceptional, memorymaking events for our clients and their guests alike. Unlike hotels and public buildings, you won’t compete for our attention. From your first planning walkthrough to the last dance, we have one focus: you. This magnificent space is yours and yours alone, and we’ll work with you to execute every detail of your experience exactly as you have envisioned it. 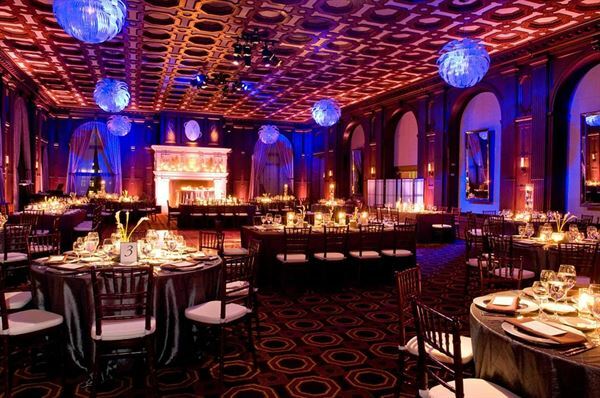 The Julia Morgan Ballroom at Merchants Exchange is a meeting venue that is not to be missed. The Julia Morgan Ballroom can be found within the century old walls of the Merchants Exchange in the heart of San Francisco's financial district, which places this venue in an ideal location, easily accessible by public transportation. It has all the modern amenities that any corporate or personal meeting holder could possibly desire, housed within years of tradition. The staff on hand is impeccable, which is to be expected in a venue like this. The ballroom can handle 550 guests seated and 800 standing. If it is your wish, it is their demand , the Julia Morgan Ballroom offers catering, bar service, photography, lighting, audio visual, floral and high speed wireless internet; among many other things. The food that is offered for events is prepared by an in house Chef, and it is amazing. There is nothing on their menu that you will not be thrilled with. The Julia Morgan Ballroom regularly plays host to large, very upscale parties for special events, so you can be sure that they are very well prepared to handle any size group without any problems. The staff is amazing and always more than professional, it is easy to see that they take what they do seriously and want to make sure that there is nothing but positive experiences. The Julia Morgan Ballroom is one of many venues that can be found in the San Francisco area, but it is definitely a stand out that should not be overlooked. This place is absolutely beautiful. Situated on the 15th story of the Merchant Exchange building, the elevator opens to a room with a fireplace, bar and lounge type area. I attended an event here that had over 350+ people. The bar service was quick, helped get people moving and was well organized and decorated. The detail in the ceiling and the floors is amazing. The ballroom itself has a grandiose fireplace at the center and very high ceilings. Everything is so gorgeous! This would be an amazing venue for a wedding or special event. We had a full sit-down dinner and the servers were the best of the best. They were nice and prompt and very helpful. There was a dance floor set up in the room as well with all the tables surrounding it. The building, even down to the entrance and the elevators is just amazing.